Brazilian environmental lawyer-turned-chef…ever since I can remember I was always in the kitchen, watchin g and wanting to learn how food was made. I come from a big family of immigrants, where food was at the center of everything. We spend hours sitting on the table after each meal just talking and laughing pretty much until it is time for the next meal.Why leave the table when you are going to be eating again soon? On my mother’s side, her family immigrated to Brazil from Spain, Lebanon and Northern Italy. On my father’s side they came from the German part of Switzerland, and a Portuguese colonizer who married a Brazilian native Indian. My grandparents are farmers, and I spent my vacations at their farm, watching my grandma make ricotta in a wood fire oven,canning and preserving fruits and vegetables, picking fruits from trees, fishing, riding horses, bottle-feeding lambs that were abandoned by their moms, waking up early to milk cows, moving cattle and just living off the land. My parents also own a ranch and most of the produce, eggs, chicken and meat they eat comes from there. Buying and eating local, sustainable and organic is intrinsic to me. I love being in nature and animals. I love to travel. I started early, since my parents always loved traveling and exploring new places and their culture. They would sometimes take my siblings and I with them. Then when I turned fifteen, I began to travel on my own. Traveling is nourishing and fulfilling for me because I expand my mind and discover new truths about life, places, culture, and people. And I also love the ocean, music, photography, yoga, meditation,tap dance, hiking, camping, art, fashion, and hanging out with family and friends. Even tough I live in the U.S., English is not my native language, and I am not a writer. So please forgive any misspelling, grammar and writing faux pas. Thank you for stopping by! Obrigada por passar por aqui! Cunha!!!! Que fofa!!! Fiquei com vontade de te abraçar! Saudades Bjos!!! Hey, that is awesome! It is always great to meet like minded people! What kind of yoga do you teach? I used to participate in tap dance competitions, and teach it too…I have to find some time to get back to it… Thank you for stopping by! I teach yoga with a friend at my college. We don’t teach a particular kind of yoga, we’re just trying to give a basic understanding of some of the poses and mentalities in yoga. It’s a lot of fun! Glad to meet another tap teacher too! Yay! Thank you! This is such an honor! Specially coming from your blog! I absolutely adore it! You’re certainly welcome and definitely deserve it! I love your blog, too! 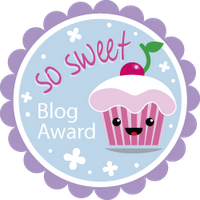 Hey, I love reading your blog and have nominated you for The Super Sweetness Blogging Award Award! Please check out my blog for details, post the award on your sidebar and spread the love to some of your favorite bloggers! Thank you so much! I am grateful and honored to be nominate by you, I love reading your blog! Happy New Year! Thank you Uncle Spike! You have an awesome blog! Wishing you and yours the best in this holiday season!